It all looks so good on the surface. After rebounding last year, Ghana's economy is reckoned to be one of Africa's fastest growing, the cedi has stabilised and inflation is dipping. Marking the news, Finance Minister Ken Ofori-Atta, known to his detractors as James Bond, floated another US$2 billion of Eurobonds on 10 May. Despite turbulence in other emerging markets such as Argentina and Turkey, Ghana's offer was four times oversubscribed and Ofori-Atta's team pushed down the interest rates. Now for the hard part. The latest bond offer, the second mega sale in a year and a half, is a sticking plaster for the government's parlous finances. The priority for Ofori-Atta is to balance the books: push down the budget deficit and pare away at the government's gargantuan debt service bill. A softly-spoken banker rather than a politician, having founded Databank in Accra two decades ago, Ofori-Atta has already drawn the anger of the parliamentary opposition for procedural missteps in the flotation of a $2.25bn Eurobond last year. His opponents are watching intently for signs that his team is favouring its old banking networks. Ofori-Atta's strategy is to restructure the debt and stretch out repayment periods. That entails borrowing more now to buy the government some headroom. However, Ghana's public debt is still nudging 70% of gross domestic product. Financial stabilisation is just the start of Ofori-Atta's brief. The bigger task is to find a way to pay for the government's ambitious development plans: universal free secondary education, a dam in every village and a factory in every district. All these – and the expectations they have triggered – will add hugely to pressures on the Treasury (AC Vol 58 No 1, New order tackles old debts & Vol 59 No 1, A year to deliver). On top of this, Ghana is leading the charge for the 'Beyond Aid' campaign, with President Nana Addo Dankwa Akufo-Addo winning plaudits across the continent for calling time on the aid industry. His argument is threefold: that the stream of illicit financial flows out of Africa, running at over $70 bn. a year, dwarfs aid receipts; that much aid is used to hire foreign development consultants; and finally that most taxpayers in Europe are rightly unwilling to finance public services in African countries 50 years after those nations gained political independence. As a lower-middle-income country, Ghana no longer qualifies for most bilateral and multilateral development assistance. To fill the gap, Akufo-Addo and Ofori-Atta are beefing up tax collection and determinedly wooing investors from west to east. Arguments over tax are still more fraught, especially the balance between charges on local business and hiking tax rates and royalties on multinational companies. Pressure is growing on the government to get tougher with oil and mining companies. The government's message is ambiguous. It is yet to announce whether it will impose capital gains tax on Norwegian joint venture Aker Energy's $100 million takeover of Hess Corporation's oil and gas assets in Ghana. And industry insiders claim the government has offered tax breaks that could be worth as much as $300 mn. to persuade AngloGold Ashanti, the world's third-largest gold producer, to resume operations at its mine in Obuasi, closed in 2014. The concession was then taken over by unlicensed miners in league with a raft of Chinese operators, protected by local politicians from all parties. Over the past decade, Ghana has lost several billion dollars from gold exports due to smuggling, mainly through Dubai. Illegal operators also wreak environmental damage, polluting water sources and destroying forests. Other mining companies complain that the government opposes purely extractive operations to export ore, now insisting that the firms build processing operations that generate more revenue for the state and employ more Ghanaians. Little has been heard of a $10 bn. joint venture between China and Ghana, announced last June, to build an alumina refinery using bauxite reserves that will supply aluminium to the West African subregion and beyond. This project has been on the drawing board since Kwame Nkrumah commissioned the Akosombo Dam in the 1960s. Another big source of funds could come from clawing back costs on overpriced contracts. The government says it has made savings from some of the most contentious contracts it inherited – the gas turbines bought at a substantial mark-up from the United Arab Emirates-based AMERI, poor-value-for-money thermal power barges from Karpower of Turkey – but is yet to produce a public audit. Industry sources believe that a Vitol/ENI joint venture producing oil and gas from the Sankofa field was particularly poorly negotiated. Progress on these dossiers is expected from the new independent Special Prosecutor, Martin Alamisi Amidu, who was appointed in January. Most pressure to raise funds domestically falls on the Ghana Revenue Authority (GRA). It raked in 32.3 bn. cedis ($7.2 bn.) in 2017, up from 27 bn. cedis in 2016, but missing its target by 1.1 bn. cedis. This year, it aims to increase revenues by over 23%. 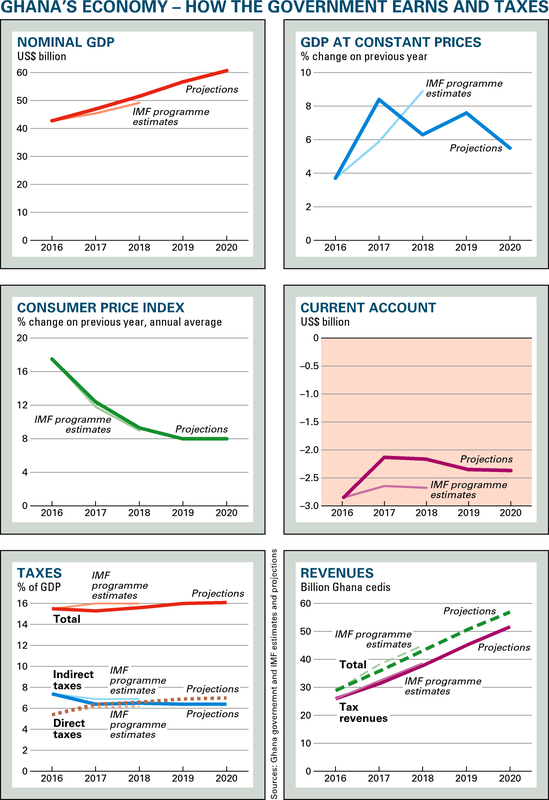 Tax revenues – how to raise them without losing local political support or deterring foreign investors – will top Finance Minister Ofori-Atta's concerns ahead of his mid-year budget review, due in July. Inflation in April was 9.6%, the lowest in four years. On 30 April, concluding its sixth review of the country's Extended Credit Facility and disbursing $191 mn., the International Monetary Fund welcomed the reduction in the fiscal deficit from 6.5% of GDP in 2016 to 6.3%. Ghana has achieved its first primary surplus in 15 years. Reforms have made management of the government's Consolidated Fund more orderly since the handover in 2017 to Akufo-Addo's New Patriotic Party (NPP) from the National Democratic Congress (NDC), led by John Dramani Mahama. Forecasts that Ghana would be the world's fastest-growing economy this year, expanding by nearly 9%, were revised down last month. GDP is forecast by the IMF to grow by between 6.3% and 6.4%, up from 3.7% in 2016 but a sharp decline on 8.5% in 2017. Growth last year was bolstered by rising prices for gold and cocoa, Ghana's main exports. The government will commission a $60 mn. cocoa processing plant this year in the Western Region, another joint venture with China. The fledgling oil industry is producing between 160,000 and 170,000 barrels a day, over half from the Tullow-run Jubilee field, where commercial production began in 2010. Output is expected to increase as drilling resumes in the Tweneboa, Enyenra and Ntomme fields, interrupted by a maritime border dispute with Côte d'Ivoire until late last year. Further concessions are up for auction as Ghana launches its debut exploration licensing round in the last quarter of 2018. Grandiose plans are mooted for four new oil refineries, each with a 150,000b/d capacity, and for Ghana to market itself as a petroleum hub for West Africa. Interest in oil and gas is reviving, helped by the forecast price rebounds. In January, ExxonMobil signed a direct agreement with the government to explore the Deepwater Cape Three Points block. The United States company had been blocked from buying up Kosmos Energy's assets in Ghana by the former NDC government, which raised corruption concerns but launched no prosecutions (AC Vol 50 No 25, The oil obstacles, Vol 51 No 1, The great oil battle begins & Vol 51 No 17, The politics of no). In February, the Norwegian billionaire Kjell Inge Røkke's Aker Energy acquired Hess's Ghana operations, which come with access to a 50% stake in Deepwater Tano/Cape Three Points. The Italian state-controlled ENI, which already owns a stake in two blocks, wants more. And the government is seeking investors to help develop the onshore eastern Voltaian Basin. The banking sector remains volatile (see Box, Bankers to government: Grow your own) and the national debt stock rose to 142.5 bn. cedis ($31.7 bn.) by December 2017. But the government's immediate priority is tax, according to Ofori-Atta. New technology and stricter enforcement will help. Some expect the minister to offer tax incentives to mining companies in his budget review. However, he declines to say if there will be new taxes. That would be an embarrassing reversal of policy. In his maiden budget in March 2017, Ofori-Atta abolished a raft of 'nuisance taxes', such as duties on car spare parts, VAT on financial services and excise duty on petroleum products. He argued that they yielded little and stifled economic activity. The 'social democratic' NDC, which adopts tax-and-spend policies – with the emphasis on 'spend' – opposed ending these measures, introduced under Presidents John Atta Mills and Mahama. In November, the Deputy Minority Leader in Parliament, James Avedzi, urged the government to reconsider, pointing to dwindling receipts and vanishing taxpayers, down from 2.5 million in 2015 to barely a million, out of a current population of 29.6 million. A return to any of the old tariffs will cost the NPP politically. Ofori-Atta argues that tax receipts have improved relative to GDP over the past 12 years, rising from 12.7% in 2006 to 16.3% in 2017. But the average for lower-middle-income economies, he concedes, is above 20%. The government will need 11 bn. cedis ($2.5 bn.) this quarter to keep the economy running, $1.9 bn. of which will go towards debt. Of the $2 bn. raised from United Kingdom and US investors in May, $1.25 bn. will be used to retire maturing Eurobonds or set aside for servicing future debt. Ofori-Atta has also led Finance Ministry roadshows to China, Hong Kong, Japan and Singapore to seek support for future 'panda', 'samurai' and 'green' bonds. A public relations team from Britain's Revenue & Customs worked on a tax awareness-raising campaign launched last year. This is now steering Ghanaians towards individual Tax Identification Numbers (TINs). A TIN will soon be needed to open a bank account, renew a passport or driving licence and acquire a national identity card. Moves to ensure that retailers satisfy excise duty requirements have met more resistance, but the GRA is gradually stepping up enforcement. The logistical challenges are huge. The GRA often works in a data vacuum. No one knows how many taxpayers there should be: estimates of the working population vary from 'roughly six million' (GRA) up to 15 million. Staff are carrying out the first real-estate valuations in decades. The old machinery for collecting property rates is barely functional. In the Greater Accra Region, home to the largest concentration of expensive real estate in Ghana, officials collected just 10 mn. cedis from rates in 2017. To help the Authority, certain tax-filing functions will be routed through the banks. The GRA will also automate more of its procedures and double its staff to 6,000. An army of young tax collectors will emerge from the Nation Builders Corps, launched on 1 May to create employment for out-of-work graduates (AC Vol 58 No 25, Power to the president's elbow). Yet the size of the civil service is a problem. Government wages absorbed 45% of tax receipts in 2017 and the IMF imposed a freeze on public hiring as a condition of its Extended Credit Facility. The ECF ends in December and the government is impatient to conclude it. Citing 'governance and capitalisation challenges', the Bank of Ghana (BoG) announced on 4 May that it had placed Sovereign, one of the country's youngest banks, under supervision. The action had been taken 'as part of [BoG's] normal routine' last month, it said. But there is a growing row within the government over the central bank's tougher policies towards local banks. Action against Sovereign coincided with the regulator naming KPMG as administrator for the troubled uniBank. Seven months earlier, it had engineered the state-controlled Ghana Commercial Bank's takeover of UT and Capital, local banks heavily exposed to bad loans. BoG moves to strengthen regulatory compliance have deepened rifts between arch-reformers and pragmatists in President Nana Addo Dankwa Akufo-Addo's government, exposing how politics holds sway over the banks. Founded in 1997 by Kwabena Duffuor, later Finance Minister under Presidents John Atta Mills and John Dramani Mahama, uniBank had connections to the then ruling National Democratic Congress that made it too hot to touch. But complaints grew after it ventured into slick media acquisitions. In 2016 it renewed a US$1.2 million sponsorship deal with the Black Stars, the national football team. And in March 2018, amid murmurs about borrowing to finance loans, it announced a reverse takeover of the state-owned Agricultural Development Bank without seeking central bank clearance. The BoG clamped down on the deal. Regulators stopped short of taking Sovereign, licensed in 2016, into administration. But their actions show how they intend to manage banks that fall short of new capital requirements. Last September, the BoG unveiled measures increasing banks' minimum reserves from 120 mn. cedis to 400 mn. cedis ($90 mn.) by the end of this year. The change has prompted bankers to accuse the government of failing to protect local business. Declining interest rates have made government debt less lucrative: 182-day Treasury bills, which attracted 23% in January 2016, fetched 13.8% in January this year (AC Vol 58 No 1, New order tackles old debts). With gilts no longer a reliable source of fat profits, Ghanaian bankers have struggled to reposition themselves. Private business does not set their hearts aflutter. The private sector nonetheless absorbed 88.1% of all bank credit in October 2017, the latest stability report from the BoG said, up 3.4 percentage points year on year. Commerce and finance consumed 25.6% of the total. Non-performing loans at commercial banks rose from 3.6 billion cedis in July 2015 to just over 6 bn. cedis in July 2016 and 8 bn. cedis ($1.7 bn.) the following year – over 21% of all loans. In August, the BoG said 95% of this stemmed from the private sector, while public sector debt had shrunk by 7.6 points. Yet banks say that individual contractors incur much 'private sector' debt to fulfil state contracts, and that the government is increasing their exposure to risk. In May, a private company announced that it is owed 10 mn. cedis for medical supplies to the National Health Insurance Authority in 2017 and is seeking a medium-term bailout. Just ten of the 35 banks in the country are controlled by Ghanaians; many are weak. Reformers, including Finance Minister Ken Ofori-Atta, would prefer to have five big, locally owned operators by persuading them to merge. This would ensure that Ghana's banks could more easily tap into global financing. We hear that two more will merge or fold before the end of May. Some predict that the BoG will axe as many as seven Ghanaian banks. On 9 April at a meeting between the Association of Indigenous Banks, regulators, the President and ministers, bankers argued loudly for more time to meet the capital requirement. For the previous increment in 2008, BoG allowed a grace period of nearly five years; this time, the banks got a year and three months. They demand an extension of the deadline from 2018 to 2022. Local bankers complain that foreign-owned banks have deeper pockets and that the government stifles 'local content' by settling quickly with foreigners, who charge interest, while leaning on the indigenous banks to offer interest-free financing and not repaying debts for years. The BoG set its new baseline 'reference rate' at 16.74% on 1 May; commercial rates go as high as 30% (AC Vol 51 No 5, Oil and optimism). Allies of the local bankers, led by Senior Minister Yaw Osafo-Maafo and Trade Minister Alan Kyerematen, urged the President to allow Ghanaian banks more time. Vice-President Mahamudu Bawumia and the BoG Governor, Ernest Yedu Addison, countered that not acting now will merely increase the size of the bad loan book and obstructions to credit flows. Exchange-rate fluctuations could render the stipulated changes meaningless in four years' time. Ghanaians, they argued, are too fond of owning 100% of nothing. Akufo-Addo agreed to set up a ten-member advisory committee, which is expected to report back by 26 May. Critics fear that the government will use the group as a smokescreen for trampling BoG independence – but Addison has his supporters in cabinet and Parliament. Prepared for Free Article on 26/04/2019 at 05:30. Authorized users may download, save, and print articles for their own use, but may not further disseminate these articles in their electronic form without express written permission from Africa Confidential / Asempa Limited. Contact subscriptions@africa-confidential.com.